The lead characters in the "Twilight Saga," (from left) Edward, Bella and Jacob. Those were among the 10 most popular girls’ and boys’ names, respectively, and it was more than a coincidence that they are also leading characters in the wildly popular “Twilight” series of young adult novels and films about vampires. The choice of baby names, you see, can be somewhat faddish. Certain ones, such as “Tiffany” and “Justin,” which were popular in the 1980s, become the rage, then fall from fashion. It certainly does appear that pop culture influences Americans’ choice of baby names. Isabella, the third-most-popular girl’s name, for instance, may be an adaptation of Bella, the vampire lover in the "Twilight" movies. “Jacob” is in the top 10, too. That’s the good-looking shape-shifter who phases into a wolf in the same series. 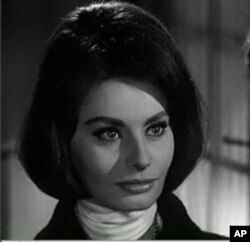 Sophia Loren in the movie, “Five Miles to Midnight,” in 1962. Curiously, “Sophia” ranks first among this year’s girl-baby names, and “Ava” is fifth. Sophia Loren and Ava Gardner were glamorous actresses on the silver screen half a century ago. We should point out that the top-10 list of boy and girl names refers almost exclusively to white, non-Hispanic babies. You won’t find many “Aidens” or “Masons” on the African-American and Latino baby-name lists.